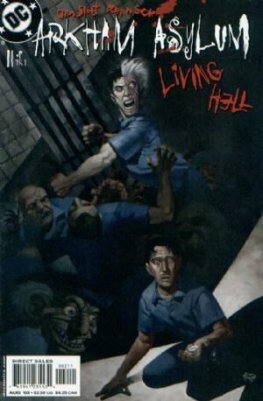 Living Hell was written by Dan Slott, penciled by Ryan Sook with inks by Sook, Wade Von Grawbadger and Jim Royal. The series was edited by Valerie D'Orazio. Eric Powell created the painted cover art which appeared on both the original series and graphic novel compilation. 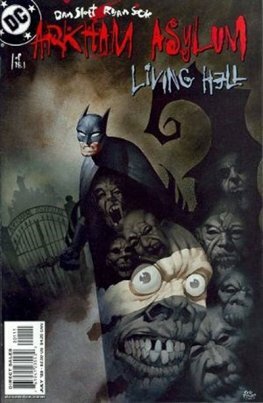 This six-issue miniseries and the subsequent trade paperback provided an intricate and multi-layered look at Arkham Asylum from several points of view: director Dr. Jeremiah Arkham; psychiatrist Dr. Anne Carver; the guards, chiefly one Aaron Cash; and the patients. There is a particular focus on previously unknown residents: Jane Doe, a cypher who assumes the identities of those she kills; Junkyard Dog, a man obsessed with trash; Doodlebug, an artist who uses blood in his paintings; the hulking bruiser Lunkhead; Death Rattle, a cult leader who speaks to the dead; and Humpty Dumpty, an obese idiot savant obsessed with taking apart and repairing various objects. The driving force is the recent admission of a ruthless investor, Warren "The Great White Shark" White, as well as the demonic element suggested by the title. White, facing charges of massive fraud, pleads insanity and has himself admitted to Arkham. He soon realizes the horrors of the place and tries to survive. Ultimately, he is locked in Mr. Freeze's cell and suffers facial wounds, coming to resemble his nickname. The demonic threat is nullified after the sacrifice of several patients.